Following the FDA 510(k) clearance of its FuseFORCE™ SuperElastic Fixation System, Solana Surgical has now announced its US launch. The system, based on the implantation of Nitinol staples for fusion procedures in the small joints in the foot and ankle, and hand and wrist, comes as a complete sterile kit. Nitinol, the original so-called memory metal, has long been used for attaining compressive fixation of bones. Unlike its competitors however, the FuseFORCE implant requires no heat to activate its spring effect, reportedly possessing super-elastic properties which help the physician attain the required compression and fixation. Probably just as noteworthy however is the way it’s presented. The FuseFORCE System consists of a complete, sterile kit containing super-elastic Nitinol staples, and all of the instruments required for implantation. A specially-designed inserter allows the implant to be loaded without handling by the surgeon. 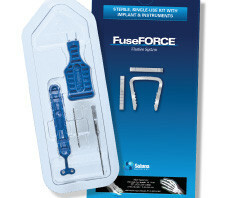 The FuseFORCE kit is one of many existing and future products developed by Solana that do not require hospital sterilization. “Hospitals and surgery centers are beginning to request pre-sterilized implants and instruments as a way to reduce their own sterile processing and liability costs. Solana is a leader in the extremity market for this innovation,” says Alan Taylor, President and CEO.